Cut Through the Confusion & Misinformation & Discover What You Really Need to Know to Make Money as a Real Estate Investor! No Hype... No Bull... Just Straight Answers from America's Hottest Real Estate Investing Experts! What do you really need to know to make money as a real estate investor in the Georgia real estate market? We've named this newsletter “The Profit” because it's all about your real estate investing profits and how to increase them. You'll go behind closed doors and learn from some of this market's best real estate investors and biggest success stories – and you won't have to pay an arm and a leg or waste hours of free time to do it. 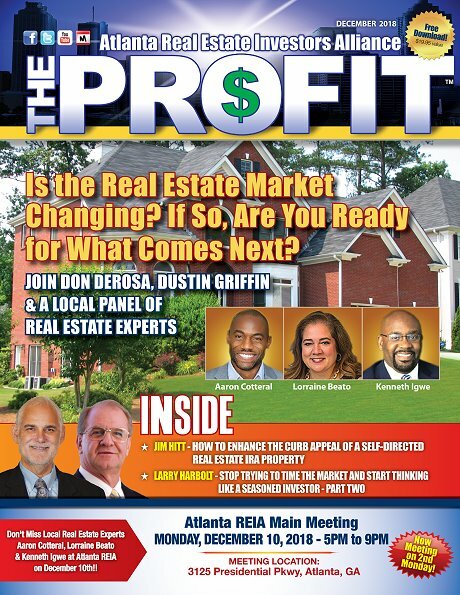 Each month The Profit brings you straight-shooting, hype-free stories that reveal the practical, real-world strategies, tips and industry news that Georgia real estate investors need to know to succeed. At Last! You Can Get Proven, Real-Life, ‘Here's How You Do It' Advice on How to Succeed as a Georgia Real Estate Investor! The magical question that gets right to your seller's bottom line with no haggling at all! Key ways to build your own personal buyer's list – FAST! You Won't Find Honest, Straight-Forward Information Like This Anywhere Else! This newsletter is carefully crafted to cut through the fluff and give you the essentials you need to know to make money investing in real estate in Georgia – or anywhere else in the world for that matter. It doesn't matter if you are new to real estate investing or an experienced investor looking to grow your business, this newsletter month in and month out delivers the tips, techniques and secrets that will help you do better deals and make more money. So don't delay, subscribe now! If this newsletter isn't everything you were expecting you can cancel your subscription at any time.